^ a b Kildall, Gary Arlen (2016-08-02) . Kildall, Scott; Kildall, Kristin (eds.). 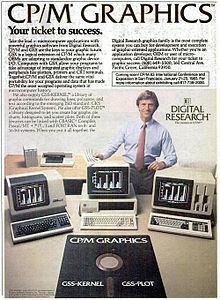 "Computer Connections: People, Places, and Events in the Evolution of the Personal Computer Industry" (Manuscript, part 1). Kildall Family. Archived from the original on 2016-11-17. Retrieved 2016-11-17. ^ Olmstead, Tim (1997-08-10). "CP/M Web site needs a host". Newsgroup: comp.os.cpm. Archived from the original on 2017-09-01. Retrieved 2018-09-09. This page was last edited on 22 April 2019, at 20:24 (UTC).